The little diesel motor carriage trundles along the tracks from Daylesford to Bullarto. Painted in mid 20th century blue and yellow Victorian Railways livery the little tourist train makes its outing every Sunday from Daylesford’s historic train station. It slowly makes it way on the slightly uneven track through the beautifully bucolic countryside. The train slowly motors through the rich red soil country before entering the deep dark forest of towering eucalypts and sprawling ferns. It travels just 9km from Daylesford to Bullarto running on tracks first laid in the 1880s. Back then you could make your way to Daylesford and around Central Victoria on a regular and comfortable rail service. In 1880 a train service opened from Carlsruhe on the Bendigo line traveling through Tylden and then stopping at Trentham, Bullarto and Musk Creek before steaming on to Daylesford. It was a popular way to get to the spa country from Melbourne and many of the historic hotels and guest houses of the era sprung up on the back of the service. By 1884, 50 000 people annually were using the service. Down the back of the train the goods wagons were packed with fresh produce freighted down to the markets in Melbourne. In 1884 the first train from Castlemaine to Maldon steamed down the track connecting the remote but wealthy gold town of Maldon with the rest of the Victorian Railways network. During the mid 1920s there were four services a day travelling the route. In 1887 Daylesford was connected with Ballarat via a line from North Creswick snaking through Newlyn, Rocklyn, Leonard’s Hill to Daylesford. This line ran for 66 years until 1953. Buses replaced trains on the Daylesford to Carlsruhe route in 1978. The golden age of rail was over. The lines were progressively closed during the 1950s-1970s. The Carlsruhe to Daylesford railway lasted until 1978 when the last train was replaced by a bus. 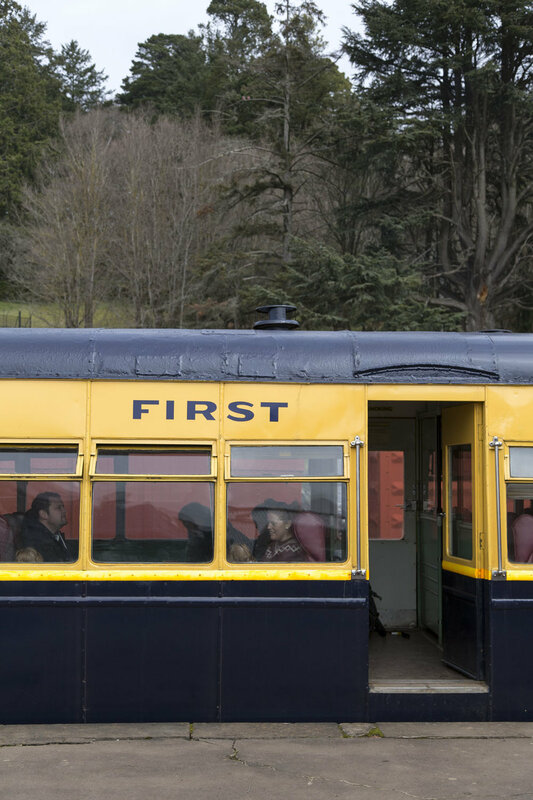 Thankfully volunteer engineers responded to a need for rail experiences and the Daylesford Spa Country Railway was established in the early 1980s. Working hard and without pay they worked on the track infrastructure and restored both diesel locomotives and steam engines. Today the rail is open every Sunday running five times a day from 9.45 to 3pm.